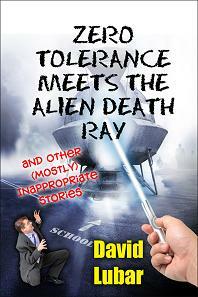 A boy gets an alien death ray from his uncle. A gamer gets hooked on casino gambling. A bully steals steroids from an enormous athlete. What could possibly go wrong? Once in a while, I'll write a story that contains an item, a scene, or an action that might be considered inappropriate for classroom reading. So that story can't go into one of my Weenies collections. But that doesn't mean it isn't a good story. I've gathered a selection of inappropriate stories, tossed in some other tales my fans might enjoy, and priced the whole thing as low as possible. Do the appropirate thing—get a copy for yourself, or for your favorite young reader. Get it for your iPad or iPod at the iBooks store.